One Eternal Day: "Where the Union Cause goes to die"
This week marks the anniversary of both the beginning of the Civil War and of the assassination of Abraham Lincoln. 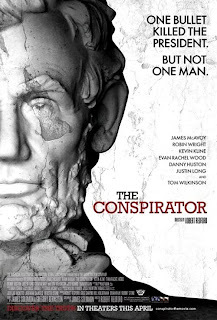 Hollywood, in the person of Robert Redford, has decided it is a good time to release The Conspirator, a film about the trial of those who would soon be convicted for the assassination, focusing on Mary Surratt, the woman who owned the house where the conspiracy was plotted. It isn't unusual for Hollywood to appropriate history to make a political point and one would be hard put to identify any recent film by Redford that wasn't politically tendentious. This Washington Post review by Ann Hornaday makes it clear that this film won't break his string. .... Although historians, including Surratt biographer Kate Clifford Larson, agree that Surratt was almost certainly guilty of conspiracy, Redford needs to court ambiguity in order for viewers to buy in to her plight, so rather than the keeper of “the nest that hatched the egg” of the would-be coup, he portrays her as a martyred mother, going to her grave rather than betray her likely culpable son (who was cooling his heels in Canada while his mother was tried and hanged). But Redford also needs to smooth out Surratt’s rougher edges because of his larger agenda, which is to portray her trial as a miscarriage of justice that, in its prosecution of civilians in military court, selective evidence, skirting of the Constitution and abrogation of due process, bears more than passing resemblance to post-9/11 policies. From the bags put over the heads of Surratt and her fellow detainees to the Rumsfeld-esque wire-rim glasses Kline wears as Stanton, Redford’s point is clear: Regardless of her guilt or innocence, Surratt was the victim of a grievous injustice that violated the most cherished ideals of the country she was accused of trying to destroy. Well, Well forget Redford's politics Mary Suratts was a victim whose was hung because of mob mentality. Her death following Mr. Lincoln's simply demonstarted the power of revenge of those who are willing to exert power to prove that they are powerful. If only President Andreew Johnson could have been free to act. That is definitely not the impression I've gotten from my reading about the plotters, most recently James L. Swanson's Manhunt. She was, I think, very much a part of the plot. I don't know if these are helpful but they may be enlightening in the case of Mary Surratt. Especially when her son John was tried using much of the same evidence as was used against her. Mary Surratt represents the Post War destructiveness of Union leaders like Stanton. We're not going to agree. Nevertheless, Redford's agenda is contemporary politics - particularly the Guantanamo POWs - and I am disinclined to reward him.